This article offers you 3 methods to rip, copy and backup Blu-ray and DVD movie into your USB flash drive for watching and playing on your TV, PC, Mac and other protable devices. Why need rip, copy and backup Blu-ray/DVD to USB flash drive? It is weird for us to carry a hardware DVD player or a device with DVD drive around if we plan for a long train journey and would like to watch DVD movies on the train. Meanwhile, there are other occasions in which your source DVD discs might get lost or broken. In such conditions, copying DVD to USB drive would be of great help. Below show you where you may need a USB drive rather than a DVD disc. Computer has no DVD drive or DVD drive is broken or damaged. You need USB drive to play back DVD movies. Transfer DVD movies via USB, especially DVD movie folder and ISO image files. From one computer to another with absence of DVD drive. Save DVD content onto USB drive for storage. Make a backup of DVD movie collections with large capacity USB drives. Play DVD movies via USB drive on TV, Tablet, DVD player, and other home appliances as long as you connect your USB drive. More convenient. Note: This method is only available for unprotected DVD folders, not work for Blu-ray discs. For unprotected DVD content, we could directly copy source DVD content and then paste it to target USB drive, as long as USB drive gets enough space. Copy and paste is the most direct and easiest solution to copy DVD to USB drive. 1. Get source DVD content ready: insert DVD disc into DVD drive of your computer, get DVD folder or ISO image file on you computer well prepared for copy-and-paste. Make sure your DVD content is not copy protected. Otherwise you may not be able to copy and paste source DVD content. 2. Plug USB drive into USB port. Computer would automatically detect it and install USB drive if it’s not installed. Make sure your USB flash drive gets enough space for storing DVD content. You could format your USB drive if there’s not enough space, or remove unneccessary files to save space. 3. Right click DVD disc drive and then select “Open”. Select all files there and copy them for pasting to USB drive. To copy DVD folder or ISO image file, right click the folder or ISO file and then select Copy option, go to USB drive and right click on a blank place to select “Paste”. Or you could select “Send to” option to send DVD content to USB drive. 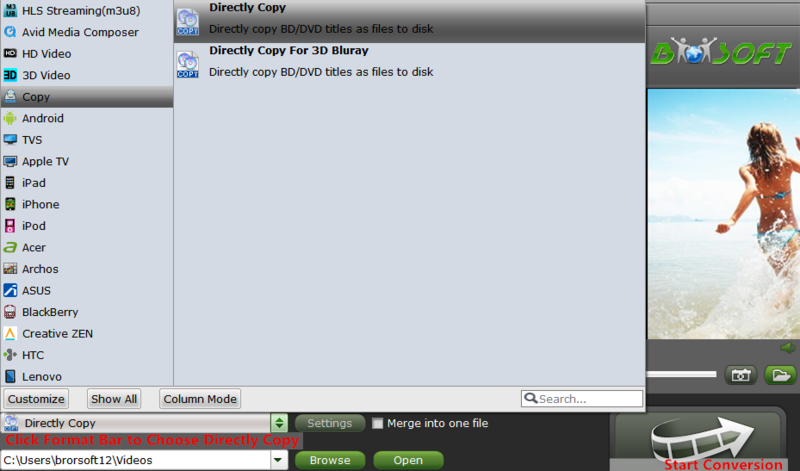 Direct copy-and-paste method is only work for DVD disc, but the second method is able to copy both the Blu-ray and DVD. You just need a Ripping tool that can handle both the Blu-ray and DVD. On choosing a right Bluy-ray/DVD to USB tool, various things should be taken into consideration, including: copy speed, output quality, price, disc protection removal, etc. Taking all these inco consideration, Brorsoft Blu-ray Ripper (Windows & Mac) tops out and has been widely accepted as the best Blu-ray/DVD copy software. The below steps would show you how to copy Blu-ray/DVD content to USB hard drive. Actually, Brorsoft Blu-ray Ripper is a Blu-ray Ripper + DVD Ripper cause it can rip both Blu-ray and DVD. It can remove the commerial protection and Region-code of Blu-ray and DVD automaticlly when you import and convert the Blu-ray DVD files to the Program(it is not mean that the region code has been removed when you insert the disc). Moreover, you can not only backing up Blu-ray and DVD with original video structures, but copy the main title of Blu-ray and DVD discs. How to Copy Blu-ray/DVD to USB Hard Drive with Brorsoft Blu-ray Ripper? The trail-before-purchase version availabel for you, the watermark is the only limitation between the trial version and full version. Here in this article, Windows version screenshots were taken as example, the Mac version shares the same steps, just keep in mind you have download the right version, Windows platform .exe files cannot be installed on macOS – and vice versa. Step 1: After downloading and installing this Blu-ray/DVD copy software, click “Load files” icon to import source files. Step 2: Choose “Copy” > “Directly Copy” from the Format menu to copy the . vob files(DVD) / m2ts and m2ts files (Blu-ray) only. Step 3: Click the “Convert” button to start Directly Copy a DVD with .vob files only or Blu-ray with mts/m2ts only. When the copying work is done, you are able to click “Open” button to get the output main title movie files without any other extra contents. Step 1: Same as Step 1 above. Step 2: Click “Browse” button to select a destination folder for the output files. Step 3: Click quick button “Copy the entire disc” to starts copying the Blu-ray / DVD disc to hard drive maintaining the original structure. It is suggested to store the files on your pc’s harddrive when ripping, cause the ripping speed faster than direct store to your USB flash drive. If you want to rip, copy and backup the Blu-ray / DVD on your large storage NAS or online storage, please turn to Backup Blu-ray to NAS | Upload Blu-ray to Dropbox | Copy Blu-ray/DVD to Seagate Wireless Plus. Make use of Blu-ray&DVD ripping software, you can rip Blu-ray / DVD to video in various formats and then enables you to transfer the converted Blu-ray DVD movies to USB easily. Here we still take Brorsoft Blu-ray Ripper (Windows & Mac) as example. 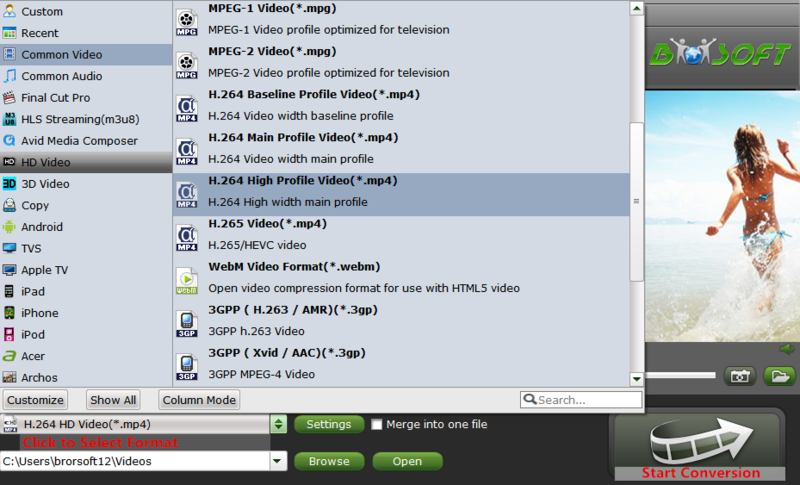 Step 2: Click format bar and choose H.264 MP4 video from “Common Video” or “HD Video” category, which can be recognized by any devices well. Step 3(Optional): And click Settings bar, you can adjust the level of compression to suit the quality you want. Step 4: Press the “Convert” button to start ripping Blu-ray / DVD movies for USB flash drive. Tip: Other container or the preset format can can aslo selected for storage in USB flash drive, such as MKV, as a container format it takes whatever you give it. This entry was posted in Blu-ray, DVD and tagged backup blu-ray to usb drive, backup dvd to usb drive, copy blu-ray to usb drive, copy dvd to usb drive, rip blu-ray to usb drive, rip dvd to usb drive. Bookmark the permalink.